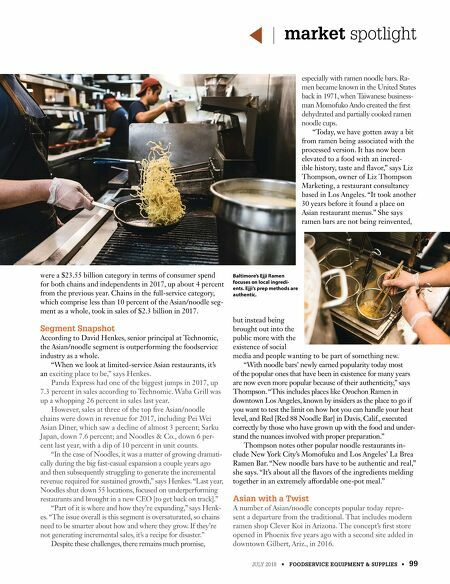 JULY 2018 • FOODSERVICE EQUIPMENT & SUPPLIES • 99 market spotlight were a $23.55 billion category in terms of consumer spend for both chains and independents in 2017, up about 4 percent from the previous year. Chains in the full-service category, which comprise less than 10 percent of the Asian/noodle seg- ment as a whole, took in sales of $2.3 billion in 2017. Segment Snapshot According to David Henkes, senior principal at Technomic, the Asian/noodle segment is outperforming the foodservice industry as a whole. "When we look at limited-service Asian restaurants, it's an exciting place to be," says Henkes. Panda Express had one of the biggest jumps in 2017, up 7.3 percent in sales according to Technomic. Waba Grill was up a whopping 26 percent in sales last year. However, sales at three of the top five Asian/noodle chains were down in revenue for 2017, including Pei Wei Asian Diner, which saw a decline of almost 3 percent; Sarku Japan, down 7.6 percent; and Noodles & Co., down 6 per- cent last year, with a dip of 10 percent in unit counts. "In the case of Noodles, it was a matter of growing dramati- cally during the big fast-casual expansion a couple years ago and then subsequently struggling to generate the incremental revenue required for sustained growth," says Henkes. "Last year, Noodles shut down 55 locations, focused on underperforming restaurants and brought in a new CEO [to get back on track]." "Part of it is where and how they're expanding," says Henk- es. "The issue overall is this segment is oversaturated, so chains need to be smarter about how and where they grow. If they're not generating incremental sales, it's a recipe for disaster." Despite these challenges, there remains much promise, especially with ramen noodle bars. Ra- men became known in the United States back in 1971, when Taiwanese business- man Momofuko Ando created the first dehydrated and partially cooked ramen noodle cups. "Today, we have gotten away a bit from ramen being associated with the processed version. It has now been elevated to a food with an incred- ible history, taste and flavor," says Liz Thompson, owner of Liz Thompson Marketing, a restaurant consultancy based in Los Angeles. "It took another 30 years before it found a place on Asian restaurant menus." She says ramen bars are not being reinvented, but instead being brought out into the public more with the existence of social media and people wanting to be part of something new. "With noodle bars' newly earned popularity today most of the popular ones that have been in existence for many years are now even more popular because of their authenticity," says Thompson. 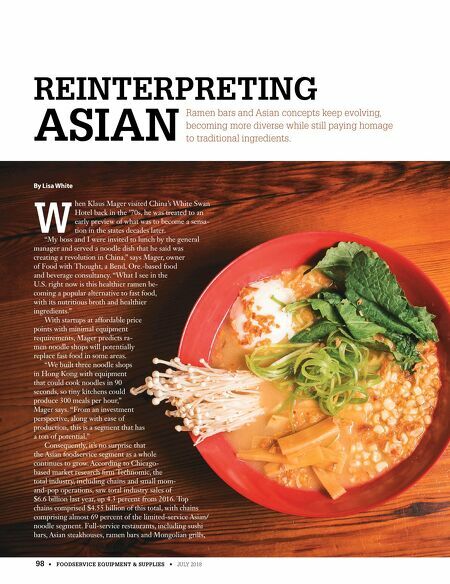 "This includes places like Orochon Ramen in downtown Los Angeles, known by insiders as the place to go if you want to test the limit on how hot you can handle your heat level, and Red [Red 88 Noodle Bar] in Davis, Calif., executed correctly by those who have grown up with the food and under- stand the nuances involved with proper preparation." Thompson notes other popular noodle restaurants in- clude New York City's Momofuku and Los Angeles' La Brea Ramen Bar. "New noodle bars have to be authentic and real," she says. "It's about all the flavors of the ingredients melding together in an extremely affordable one-pot meal." Asian with a Twist A number of Asian/noodle concepts popular today repre- sent a departure from the traditional. That includes modern ramen shop Clever Koi in Arizona. The concept's first store opened in Phoenix five years ago with a second site added in downtown Gilbert, Ariz., in 2016. Baltimore's Ejji Ramen focuses on local ingredi- ents. Ejji's prep methods are authentic.